Each year, alumnae of all ages send special notes, or “telegrams,” to students performing the role they once played in The Christmas Play. As you will see, this production still holds a special place in the hearts of our alumnae. Here are the telegrams received this year. Enjoy! Best wishes to you in your performance! As a boarding student for five years, I graduated in 1944. I played the role of the shepherd boy Trowle for three years. I also acted in the Shakespeare Plays in 1943 with Barbara Pierce Bush in Much Ado about Nothing. I will be thinking of you. Spent seven fun years in the play. Was a jester in the crowd and the red choir for 4 years. It is very hard to believe that 65 years ago I was in The Christmas Play. I was a member of the red choir and will always remember how fortunate I was to have had this wonderful experience. Best wishes to all of you and Merry Christmas. Break a leg! Have a grand time the evening of the 7th! It’s a beautiful experience—one you’ll always remember! Thank you for sharing this glorious message with the gift of the Ashley Hall Christmas Play. I was blessed by being Joseph in the 1953 play. Ms. Bewley was the director and in charge. Every Christmas I remember the entire experience with joy! Peace and joy to you each with love and gratitude. Greetings and Best Wishes to each and every one of you. To those of you who may be new to it, it will become one of the most powerful and memorable events of your lives. I was first in The Christmas Play in the eighth grade. I felt so special to be among the towns-people in my musty costume which had been worn by so many girls before me who felt the same excitement I felt at being a part of something so beautiful, given as a gift to my community. The following year, (9th grade) I decided to spread my wings. And even realizing my singing voice was not very good, I had volume, which Mr. Fracht, the director, was eager to have in the huge concert hall of Memminger Auditorium. I was in! I was actually in the coveted Red Choir! It was wonderful. In fact, I was in the Red Choir the following year too. I loved it. But the following year, 11th grade, I wanted to try something else. There was so much available, considering all the backstage jobs with make-up, costumes, listening to lines, soothing jitters…It suddenly seemed to have endless choices to help pull this much anticipated pageant together. And every job was equally important to have a success. There were tryouts for the Shepherds and Kings. I hadn’t done that. So I showed up, and low-and-behold, I found myself a Shepherd with an itchy brown beard. What fun that was, being part of the miracle in the manger. How humbling and precious that was. In fact, I liked being a Shepherd so much, I tried out again my senior year. I was chosen for a different Shepherd, still with an itchy brown beard. I had gone from town-folks to Red Choir to Shepherd. I thought if I only had a few more years at Ashley Hall, perhaps I would be a King. Or Mary. Or an Angel. But what I had been given those five Christmas seasons was more than enough. And what I want you young ladies to understand is that whether a town-folk, a part of the Red Choir, an Angel, a Shepherd, a King, Mary, or backstage, you are important. You are the play. And you, like I, will remember it and feel its beauty all of your lives. Because it is special; it is so very beautiful and special. And when you reach 78, as I am, of all your memories at Ashley Hall, you will recognize this play as one of the best. The beard itches and the cussword horn won’t blow. Next year be an angel! Have fun. Best wishes. I was an angel in The Christmas Play in 1959 and I still remember being chosen for this part as one of the important memories of my life. Best wishes! Best of luck to all the cast. I have the most wonderful memories of being in the play from jester to angel to many years of singing in the Red Choir. Such a great tradition to be shared with the Charleston community. The perfect way to spread the true Christmas spirit and meaning. I want to wish best of luck to The Christmas Play O’ Holy Night soloist! It is my all-time favorite solo—also the most difficult. I performed it as a 15 year old in 1969 and remember the entire experience like yesterday. I know you will do a beautiful job. Look at that high as a mountain to climb and you will do great! With best regards! Best to all in the play, especially to Oh Holy Night soloist from a 1970 Soloist. Break a leg! Greetings from Cincinnati! Like most Ashley Hall alums, I have such fond memories of The Christmas Play. Being a Jester was so fun and I remember hopping down the aisle and bonking my father on the head with my bells! In Upper School, I sang solos in the Red Choir and it was so exciting to look out onto the audience when the curtain rose. We used to put red dots in the corner of our eyes to make them bigger. Do you still do that? We always looked forward to the telegrams that were read before the performance and I hope you do, too. Have a special time and enjoy! Greeting, I am so happy for each and every one of you for being in this beautiful play. I was the Green Angel my freshman year and the Red Lady my senior year. And I loved seeing my daughter Elizabeth Scarborough sing a solo her Senior year especially since I could not carry a tune no matter how hard I tried! Break a leg and blessings! Dr. Weston reminded us that this will be the 95th annual Christmas Play! What a tradition! Thanks to all for making it come true. This year also has special memories for me: 95 years means my mother was probably in the play; my sister and I were the next generation cast members and this year, my daughter is the 3rd generation in the play which is very special to me. I also remember my good friend Madge Hallett singing O’ Holy Night in the play and I look forward to Ally’s performance tonight! Break a leg, girls. Have nothing on Gray Griffen on this night! You’re gonna miss these days with all your hearts! Breaketh legs, strings and vocal chords! To the Pages: Break a leg. Things were a little different in my day; we actually had the play at the Gaillard Auditorium and the pages opened the curtain for the congregation who entered the stage that way. We were the first people on stage and it was terrifying! I love the way you do it today in a church. Have fun and remember that there is a future for you in the play in high school! To the third Shepherd: Please do not break a leg since you’re already pretty feeble! Sir in faith now I come for I have not done all that I have to do! I wonder if you are wearing the same costume from 1976? Good luck on a wonderful Christmas Play and thank you all for your gift to the city. Best wishes from a former Trowle! My time performing The Christmas Play remains a cherished memory—even though the seniors pulled a prank and put a note in the manger! Take a moment and take it all in—the music, the pageantry, the friendship. It will resonate for years to come. Thank you all for carrying on this wonderful tradition of The Christmas Play at Ashley Hall! Stand tall and regal all of you Kings! Ho Tuddy!…get those sheep to the low!…angels put on a heavenly smile…Especially you two dressed in blue…Caroline and Lawson Walters! Enjoy this moment, it will define Christmas for you as grow old! PQV! Ashley Hall is a school where tradition runs deep, and none are deeper than the Annual Christmas Play. I remember like it was yesterday being in the Green Room at Galliard Auditorium and someone reading out the letters from alumnae who had participated in years gone past. It is unbelievable to me that I am now writing a letter to my girls and their friends who although it seems like they have just started their Ashley Hall adventure, are actually seniors getting ready to embark on an entirely new adventure. Time really does fly by girls, try to slow down these last few months at school and just enjoy the time you have at Ashley Hall. You might not think so now, but you are going to miss these days. Caroline and Lawson, you are angels to me all the time. And even though you chose to be blue angels like Parker, and not the yellow angel like your ole mom, I know that you will be absolutely beautiful. I am so proud of the girls y’all are. And a special good luck to whoever is the yellow angel! To the other angels that I know and love…Olivia, Pearce, Celia, Lucy, Virginia, y’all are awesome and I know you’re going to rock the wings! And Riley Turner, I have no doubt that you will be a stellar monk. Good luck to everyone tonight, have fun. Ashley Hall is an incredibly special place and as you get older, the memories become even more special. Even today, my Ashley Hall friends and I know every word to The Christmas Play or have been known to burst into singing the Ashley Hall song at a party. Ashley Hall and traditions like The Christmas Play stay with you forever. Seniors, take a minute to look around, these girls that surround you are your family. No, you may not be best friends with them all, but you have a bond that will never be broken. Have fun tonight girls and treasure the time you have left together! I’m wishing each Senior a memorable experience as The Christmas Play is very meaningful. To Pearce, there is nothing more special than a red headed angel! To the little angels, I was one of you in 1974. You have a very special part in the play and everyone will love seeing you. I still remember walking with my hands folded and following the mother angel. Enjoy this night and remember it forever. To the congregation, we used to participate in the congregation starting in the 7th grade and I was a proud member of the congregation for 5 years! We had very heavy, musty costumes that made us feel like we were truly in medieval times. It seems like we attended practices for weeks and by the time we performed the play, we knew every part in the play by heart. The Christmas Play was an incredible bonding experience for us and you will always cherish the memories of this night. To the Red Choir, sadly, I was not in the Red Choir (I tried out but did not make the cut.) You are one of my favorite parts of the whole Christmas Play. I still remember my friends singing in the Red Choir and especially our friend, Dana Smith, who sang O’ Holy Night. Long after tonight, we will remember your beautiful voices, too. To the Angels, especially my angel, Virginia I remember my senior year at Ashley Hall and dressing in the colorful, flowing angel costumes with so many of my classmates. We couldn’t believe our time had come to take part in the tradition of the Ashley Hall Christmas play as seniors. It will be inspiring and emotional to see you all tonight. I’m so proud of you and thankful that you are part of this Ashley Hall community. I hope you will return to see future generations participate in this play and maybe one day, like me, you will attend with your Ashley Hall friends and watch your daughter and goddaughter (Ellie Barham), play their parts in carrying on the tradition of the Ashley Hall Christmas Play. God bless you all and Merry Christmas! CONGRATULATIONS on being the cast of Ashley Hall’s 95th annual Christmas Play! Whether it’s your first or last year of being part of this special tradition, I hope you will enjoy every minute of tonight! You’ve done all the work—now sit back and enjoy the tradition, story, costumes, songs, music and memories. Anyone who has been in the play realizes it becomes a part of you and it’s my favorite way to really embrace the Christmas season. Alumnae, like myself, will always remember the years we were in the play but tonight is your night and we want to say THANK YOU for keeping this tradition, for all of your hard work and for making tonight a special gift to all who attend. We, as alumnae, hope you’ll share in the special memories and for you Seniors—take it all in. It’s a gift to all who attend but evermore so for those who participate in it. A special shout out for my girl, Ginia, on being an angel this year—just like your mama and Godmother were when we were seniors. You may be nervous but please remember to have fun. I, personally, was a page, a jester, a long-time congregation member and finally, Mary my senior year. There are no unimportant parts. Every part comes together to makes this the beautiful event that it is and we, alumnae, thank you for carrying the torch onward. A special congratulations to ALL Seniors as you will always remember your friends’ parts and solos and this moment now when you return to this special night for years to come. Another special congratulations to Ellie Barham for carrying on the Page tradition in our family and to her friends who are participating in this year’s production. To whomever has the O’ Holy Night solo—I already thank you. That along with the little angel’s entrance are my favorite moments of the evening. I look forward to the ringing of the bells. Go get ’em girls! Holiday greetings from Seattle, Washington. 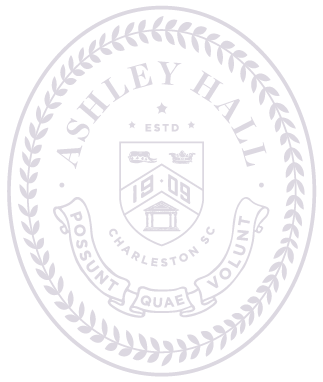 I spent 2.5 of my best school years at Ashley Hall while my dad was stationed in Charleston with the Navy. I was in the choir directed by Sam Shephard, and we performed in The Christmas Play. I can still hear us singing Magnficat. It is a magical night and you will have memories of this beautiful evening forever. Best of luck and have fun! When I was a senior, I so desperately wanted to be the lead angel because I’d been a little angel in first grade and thought it would be a neat “full-circle” moment. However, it was not meant to be. Another girl got the part, and I was given the role of a regular angel. In spite of my disappointment, I felt so beautiful and special on the day of the play and learned that I did not have to be the lead to enjoy every minute. My best friends were shepherds with skin stained brown, congregation members with funny hats, fellow angels in pastel gowns, and even lovely Mary. We have such great memories of being together, and our individual roles really didn’t matter in the end. Enjoy your time in the spotlight, even if you may not have gotten the part you wanted. You’re all beautiful and special and part of this wonderful Ashley Hall tradition! Merry Christmas! As you all prepare this evening to give to this community one of the most amazing gifts of the season, I want to take a minute to thank you all for your dedication to Ashley Hall and it’s Hallmarks: creative; compassionate; intelligent; worldly; collaborative; purposeful; and discerning. All of these qualities are essential to the success that I know tonight’s performance will be. Not only an Ashley Hall Alum, the daughter of an Ashley Hall alumna, sister of two Ashley Hall alumnae, but also the parent of a current Ashley Hall student, I can tell you that you are all a part of an amazing tradition, currently selfless, but in reality as you reflect on your years at Ashley Hall in the years to come, undoubtedly a timeless gift to yourselves. The memories you will take with you from dedication to this tradition will “pop-up” in your hearts and minds not only at Christmas, but also at unexpected moments throughout your lives. Thank you all for this gift which I know I will once again cherish in so many ways as I reflect on the many years in which I participated, but this year especially because of a jester and member of the chorus who calls me Mom. Isabel West, thank you for your part in this gift, as it is the single most treasured Christmas gift I will receive. You know Dad is proud and shining through you tonight! I would say “break a leg,” but knowing Isabel, that could become a reality. What I will say to each of you is let your light shine and enjoy giving this gift. PQV! This marks an amazing period in your life. Your senior year is halfway over. As you raise your hands and say those magic lines, remember you will join a special club of Ashley Hall Angels. We are proud to stand with you, and as you look into the audience, you will see our smiles of encouragement. Let our light carry you forward onto graduation. As you look back over your time at Ashley Hall, let the spirit of the Ashley Hall Christmas Play stay with you and serve as a reminder of your Ashley Hall family. They will always be a steady beacon of light now and in the future. I held many different roles in The Christmas Play throughout my 13 years at Ashley Hall. When I wasn’t participating in the choir, I was the “littlest angel” in 1st grade, what fun I had as a Jester in 7th grade and I will never forget hobbling down the aisle with a staff in my speaking role of Tudde the oldest Shepard my senior year. To my niece, Isabel—You did amazing in your first Ashley Hall Christmas Play in your role as the “littlest angel!” This year you are a Jester…This was Aunt Liz’s favorite part to play! As you jingle down the aisle making everyone smile- remember to have FUN tonight! Good luck to everyone as you make final preparations for the big performance that you have rehearsed for so much over the past few weeks—I can’t wait to see the final product! Break a leg girls! I ALWAYS loved this play. I was a King 2 years in a row in high school and a jester in middle school. I’m sure the play continues to be spectacular! What an honor! You have such a great part in the play. Congratulations! I was the Speaking Angel in December of 2004 and wish you the best of luck! You play such an import role and the little angels really look up to you! I know you will shine in this year’s play! Break a leg! The Ashley Hall Christmas Play is one of the greatest traditions of all time! I loved being in the play year after year from a jester to singing in the Red Choir to a (purple!) senior angel. So many memories of Sam Sheffer conducting the beautiful music of the Red Choir—my absolute favorite part. There is truly nothing like it to better welcome the holiday season. I am sure Barbara Bush ’43 is looking down on the entire cast this year cheering you on too—best wishes cast of 2018! My name is Madeline, and I am Rebecca Spratt’s oldest sister. I graduated in 2006. During my time at Ashley Hall, I was in many productions, but The Christmas Play was the most special. I was in the congregation, a jester, and a monk. Tonight, you will join the many alumnae who have come before you and become part of one of Ashley Hall’s wonderful traditions. Look around you—the girls you are surrounded by are smart, talented, strong, independent, and fearless. Each one of you is so special—enjoy this experience and time together! I promise you won’t forget it. I know that you will do a wonderful job and make this year’s Christmas Play the best one yet! Best wishes, and break a leg! Sending extra love to the tallest angel! Love you, Rebecca! With lots of love! Hello to all the jesters! Don’t let anyone fool you—this is low key the best part in the whole play. Be silly, be cheerful, be funny. Jangle those bells. And make sure to take plenty of pictures in you costumes because trust me those are pure gold later in life. I can’t believe it’s been two years since I was a blue angel and in your place. As long as two years may seem, it goes by so fast. The Christmas Play is something you’ll remember for the rest of your life, what color angel you were, who you walked in with, and who the mother angel was. Caroline and Lawson, I’m so proud of all that y’all have done (especially choosing to be blue angels like me over yellow like mom), y’all are so smart and beautiful and going to go so far in whatever you choose to do. Olivia, Pearce, Lucy, Celia, Virginia and everyone else, I’m sure y’all look amazing and will look like shinning lights walking through the church. Ashley Hall really is a special place, I know you’re rolling your eyes right now because I did the same thing too; but looking back I truly cherish the moments I spent there with the girls I know and love. Everyone in the room right now is connected to you in a special way and you’ll look back on these past years and smile when thinking of them. Have the best time tonight and make this last year count. Hi friends! Firstly I’d like to wish the entire cast good luck and that I hope you enjoy this night to the fullest. I hope all the angels feel beautiful as ever and I hope you can cherish this special time with your classmates. The Christmas Play my senior year was one of my most sentimental memories from Ashley Hall and I hope it can be for all of you as well. I’d like to wish all the shepherds the best of luck. I know the shepherds aren’t the most glamorous characters, but you all help carry on this beautiful tradition and your roles are just as special and needed. Lastly, to Tudde I hope you can love this role as much as I did. After playing Tudde for three years, I feel as though a part of Tudde will always be within me and I hope the same thing happens to you. I hope everyone feels immense joy tonight as you carry on this tradition. I love you all! PQV! Dear Strings Girls, First of all, I miss you all dearly and am so incredibly proud of all you. I hope you all remember to enjoy this festive time of year at Ashley Hall with your strings family, even though it may be hard with all those good ole playing test and terribly uncomfortable black concert dresses. You will remember The Christmas Play for the rest of your life, and because you’re in strings some of those memories might be a bit odd. For example I have a vivid image of LouLou and Ann dramatically lip syncing the words to every choir song because they did that every. Single. Year. Or the rehearsals when you ask yourselves, “why am I here?” Or every time someone fell down the stairs because they tripped on their dress. I will never forget in the fifth grade (I think it was fifth grade) we played in The Christmas Play for the first time and I got in so much trouble because me, Ann, Meaghan, LouLou, and Anna Faliero were playing with my sequin covered shoes, but Mrs. Rice and Mrs. Schweers thought it was my phone. I still don’t think they would believe me to this day, but I don’t blame them, I wouldn’t believe me either. Remember to love each other and relish in the little moments that you have with the people around you. Whether you like it or not, this strings group is your family. Even when you’ve moved on from Ashley Hall you will always still have each other. It still comforts me to know that I can come crash a strings class, take a nap on the couch, steal a mint, and leave terrible art on the board, whenever I need to. Good Luck Ladies! Hi everyone! I cannot believe it’s already time for The Christmas Play! For me, it is one of the best traditions of Ashley Hall. You enter the church, filled with family and friends, and the rush of it all just hits you. My final year being in The Christmas Play was the most special to me, looking out for the last time in that wonderful place performing something so spectacular with some of the best people I will ever know. This is my first year in college and I am super upset I cannot be there to support. Even though I won’t be there, I still want to wish you all the best tonight! To all the actors, capture the audience’s attention in those fantastic costumes and makeup. To all the string players, fill the church with your magical music. Lastly, to the choir, sing your hearts out. I miss you all dearly, but I know you all are prepared for this. Shoutout to the Silent Night soloist, I know you are going to do amazingly. All you have to do is do better than me last year, which is gonna be easy. You are the final singer to the ending of The Christmas Play, and I hope that, if you have a chance, look to your choir before going up those stairs. It will be the last time you do the Play with them. The fact that I am no longer with some of the best people I know anymore makes me so sad, but, I am forever grateful for the time I spent with you all. So, everyone, break a leg! You all will do great job just like every year. Joseph, the itchiness of the beard is temporary, you’re going to do great! And to all the angels, congratulations you’ve made it. The night of The Christmas Play for myself last year marked the start of the end. I remember being there, surrounded by friends, all the angels huddled together listening to the messages and it was the first time many of us had this realization. I’m sure you will be ethereal tonight and I hope that you all remember to recognize, appreciate, as well as celebrate all of the “lasts” you’ll be experiencing this year. Best wishes to everybody! It makes me sad to think that this is my first year not being in The Christmas Play! However, being able to write a telegram is new experience and I hope it can be read. Standing in my enveloping white dress in the crowded parish hall of First Scotts Church in 2006, I felt extremely shy under the yards of cotton fabric. Milling about excitedly was the cast of my first Christmas Play. There were groups of girls with beards dressed in rags, jesters with bells that rang with every movement, kings that stood tall in their imperial costumes, and honored seniors as angels. Yet, there I was, a small first grader looking up at all of these big girls. I wondered if I was capable of performing my little part comparable with all of their big roles. All of a sudden, there was a loud crash. The Mother Angel hovering by, swept her hands back to protect me and the other little angels from the shattered candlestick light bulb that had just exploded onto the floor. In a quick moment, I knew that I could trust this Ashley Hall senior. To this day, I still think back to her as a role model who inspired me to carry on participating in The Christmas Play and eventually be the Mother Angel. Because of my experience, I know that Candice will lead all you little angels with enthusiasm and kindness. Originally as a little angel, The Christmas Play meant to me then that I had to walk down an aisle, kneel over a cradle, and follow behind my Mother Angel off stage as directed. While, in the 5th grade, it meant that I had to play everything perfectly in tune because I was accompanying the choir with my strings class. Being a part of the first strings group to accompany the choir in The Christmas Play encouraged me to work harder so that I could play more pieces in the repertoire. It was a privilege to be a part of the original strings accompaniment that has evolved over the last seven years. I feel as though, with the strings, the music of The Christmas Play has gained more attention and appreciation. It means a great deal to me that the strings now plays a vital role in the musical components of the traditional play. So to all of my strings friends out there, I hope you have been mouthing (but mostly singing out loud) every word to the choir songs and been saying the actors lines with them from the balcony. So many memories and inside jokes have been made from the strings corner in the balcony. To name one, you may have seen the video, of Meaghan singing along to the choir and not noticing that I was licking her elbow. Good times. Oh but how could I ever forget Christmas Day in the Morning. I honestly don’t know what else to say about that song except that every time I played it there were different fingerings and never the same bowing. I’m sure Ms. Dinwiddie is not shocked. Lol. Love you Dinwizard. And I love all you strings homies. Looking back on my nine years of involvement with The Christmas Play, it represents a tradition that I have helped to further its continuation. Being a part of a school wide event, which people from all over Charleston come to see, brought me pride to participate in such an ongoing community experience. Even though over the years, the songs have been changed, (except Christmas Day in the Morning) the costumes have been altered, and the choreography has been tweaked, the school wide inclusion has stayed the same. And on that note, the last thing I will write to you all is that every single person in this room is important. Even if you don’t say a word or you only sing the songs, or you say “ho harvey ho”, everyone’s part adds up to the whole that makes this play possible. Perform your part to the best of your ability, it’s okay to make small mistakes, I don’t doubt that I made one every year, and enjoy it in the moment, that’s the most important thing.